Managing your refrigerant has never been this simple. 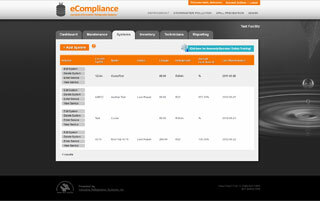 eCompliance is your solution for all your EPA Clean Air Act Section 608 compliance program needs. It is a web-based, centralized, paperless Freon refrigerant management resource with data storage and reporting tools. For ordering information please call us at 1(540) 246-0494 or email us. 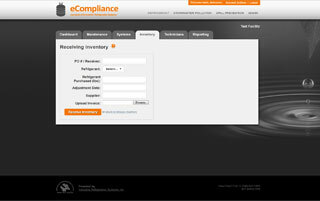 eCompliance will make your compliance program easily understood by operators, technicians, safety managers, and supervisors. No need to search through a stack of paper or a file cabinet. Your data is stored electronically and is easily accessible. 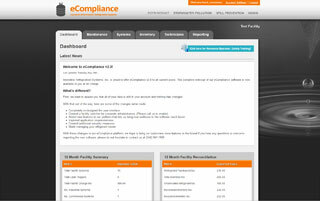 Using eCompliance is as easy as it gets. Anyone on your team will be able to use our software. Get notifications and schedule the different aspects of your refrigerant management program online. 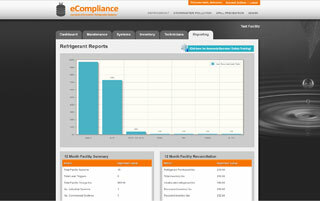 eCompliance ships with everything you require to make your compliance program a success. 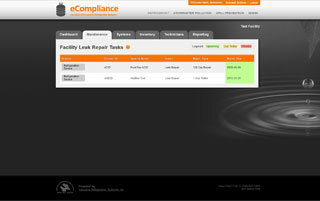 Track your refrigerant and equipment inventory to ensure nothing goes missing. Our support team is available to answer your questions.
" 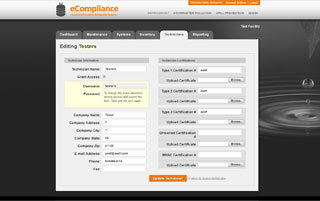 With eCompliance, we finished building and documenting our EPA compliance program within a week of getting setup. Ongoing maintenance and continual improvement has been a breeze and we haven't missed a single deadline in the year we've been using it. " Interested? Call or e-mail to get started!